After reading the Economist magazine September 2010 issue, I realized that Jakarta had a new call: the largest city in the world without a metro. The Economist reported that the car ownerships in Jakarta have increased by 10-15 percent a year. Motorcycles are ubiquitous and can be acquired with a down payment of as little as $30. On the other hand, the growth rate of Jakarta’s road is less than 1 percent a year. The daily jams in Jakarta are getting worse. Jakarta is estimated to lose $3 billion a year due to transport delays and attain total traffic gridlock in 2014. The acute traffic congestion in Jakarta has also prompted President Susilo Bambang Yudhoyono to revisit the idea of capital relocation out of Jakarta. Relocating the capital out of Jakarta could reduce urbanization and the rate of car ownership in Jakarta and its surrounding areas, but it will not completely address the traffic congestion in Jakarta. 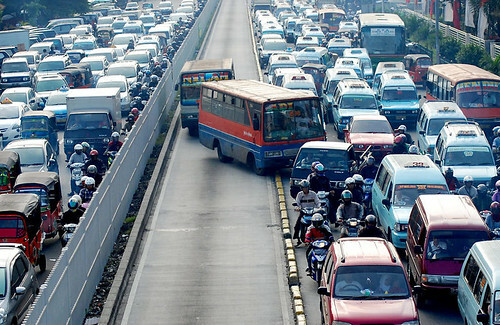 Jakarta needs a fundamental change in the management of public transportation. The current public transportations have not been able to alleviate the acute traffic congestion in Jakarta. Jakarta now needs the Mass Rapid Transit (MRT) or also popularly known as Metro to address its transportation problem. Most metropolitan areas in the world with the population of over 10 millions have operated metros for years. New York City opened the first underground line of the subway in 1904 and the subway has been the backbone of New York City transportation system since then. Two major cities in Japan, Tokyo and Osaka built their metros in 1927 and 1933 respectively. The Tokyo Metro is the world’s most extensive rapid transit system with more than eight million passengers daily. 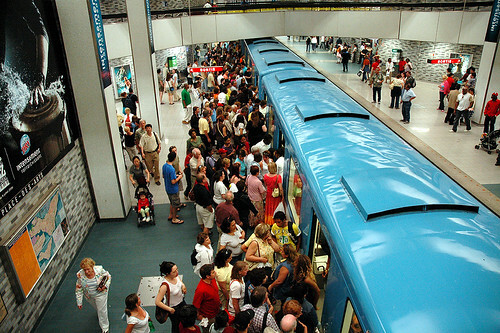 The second largest city in the world, Mexico City, has built a metro since 1969 and now the Mexico City Metro is the second largest metro system in North America after the New York City subway. Two major cities in China, Beijing and Shanghai opened their metro systems in 1971 and 1995 respectively. Major cities in Southeast Asia which have fewer population than Jakarta have also had their metro systems for years, including Manila (1984), Singapore (1987), Kuala Lumpur (1995) and Bangkok (2004) (Wikipedia, 19 October 2010). The MRT would become the most expensive public projects in Jakarta’s history, but it is the answer to avoid the total traffic gridlock in Jakarta. For at least 20 years, the proposal of MRT in Jakarta has been discussed by the Jakarta city administration and the government of Indonesia. The activists and non-governmental watchdogs have seen the MRT proposal as a possible bonanza for corrupt politicians and contractors (Economist, 4 February 2010). Eventually, the government secured a $1.6 billion loan agreement with the Japanese International Cooperation Agency (JICA) in 2009 for funding the Jakarta's MRT project. Vice President Boediono has also asked the JICA to expedite the design and construction of MRT project to alleviate the traffic congestion in Jakarta. The final project designed was expected to be completed in 2011. The first tract of the MRT project was expected to connect the Hotel Indonesia traffic circle and Kota in 2016 (The Jakarta Post, 20 October 2010). I would suggest two fundamental steps for the Jakarta city administration in order to effectively address the acute transportation problem in Jakarta. First, integrate the MRT project with the current public transportation modes including including the Transjakarta Busway, Metromini, Kopaja, Angkot, City Bus, and Mikrolet. The reliability, accessibility and affordability of the public transportation system should be improved for all levels of Jakarta residents. The development of public transportation system should also consider the needs of residents in the Jakarta’s hinterlands including Tangerang, Bekasi, Depok and Bogor. Second, convert car riders and motorcyclists into public transport riders/MRT riders. This would be the critical key for the Jakarta's success in overcoming the traffic congestion. Without the conversion of car riders and motorcyclists into public transport riders/MRT riders, the traffic congestion in Jakarta would never be resolved and the MRT project would be an ineffective investment. The conversion of car riders and motorcyclists into public transport/MRT riders is not an easy thing to accomplish. A careful and comprehensive planning that involves various stakeholders is needed. The Jakarta city administration also needs to learn from the experience of the Transjakarta Busway operation particularly on how to effectively convert car riders into the Transjakarta Busway riders. Last but not least, the inconvenience of car riders and motorcyclists due to the acute traffic congestion in Jakarta could be considered as a great asset for converting them into public transport/MRT riders. The public transport and MRT system should offer reliable, accessible, punctual, comfortable, safe and affordable transportation modes in order for car riders and motorcyclists to leave their vehicles and ride public transport and/or MRT as their primary transportation modes. One of my big concerns for the success of the MRT project, and encouraging motor vehicle users to shift transport modes is the lack of pedestrian access in Jakarta. Imagine that you leave your MRT stop... how easy is it to get to your destination with the broken footpaths, hundreds of obstacles, dangerous holes, no pedestrian crossings, severance down arterial roads that prevent people from crossing, entry to shopping malls and offices are all designed to facilitate vehicles but not people. An MRT project will need to involve a complete reconceputalising of the concept of ACCESS. Transport is too often conceived as the mechanism of moving people and goods around. If we re-envisage transport as the mechanism by which people gain access to goods,services, employment, etc then planners in the city might begin to consider how they are going to need to engage large trip generators (malls, offices along Sudirman) to facilitate the efficacy of the future MRT. The MRT, Busway & other public transport options do have to be affordable, comfortable, fast, reliable and accessible, but so does the last 5-15 mins that people have to walk to get to their final destination. Currently few Jakartans would ever conceive of walking somewhere, and I would argue that this has as much to do with the unpleasantness of the walk as it does with laziness. MRT cities are also by default largely walking cities. So an MRT will be good for public health, but it requires the necessary infrastructure to enable this. Great article, and yes MRT would be very useful in Jakarta. But so sorry, MRT won't work in Jakarta. The reason is that Jakarta is sinking, at different rates in different parts of the City. Building an underground MRT is therefore inviting disaster, and given Indonesia's appalling safety records, such calamity would kill many lives. "The reason is that Jakarta is sinking, at different rates in different parts of the City." - so is Bangkok but the design is able to cater for this. "Building an underground MRT is therefore inviting disaster, and given Indonesia's appalling safety records, such calamity would kill many lives." - same was said of the Bangkok metro in 1996. Bar one little mishap with a hand brake the system has worked well.